We are pleased to announce that as of 1st April 2018, Peacock Healthcare will be under new ownership. We will now come under the "umbrella" of Integrated Medical Holdings (IMH). IMH have in the region of 50 practices across the country which they support and we are very exited at being part of a larger organisation which forms part of our sustainability strategy and will ensure we will continue to provide medical services to our patients in the Carlton area. As part of our on-going link with the medical school based in Nottingham we have commenced a programme of training and support for student Pharmacists who have an interest in working with GP's in general practice. This will continue througout 2018 and is intended to help the promotion of and the value of having Pharmacists permanantly based in GP practices. The Notts Help Yourself Website www.nottshelpyourself.org.uk is a searchable database of local information, which can help you find out about a wide range of activities, groups, services and events at the click of a button. It’s a fantastic tool for you to find the advice, services and support you need in your local area. You will be amazed at what information you can find from tea dances to local kids clubs, men in sheds to knit and natter groups not to mention local health related support groups. You can search by type of service, location or age group. CCTV cameras are installed throughout the premises; mainly in the public areas though there will not be any cameras in consulting rooms or any other private areas allocated for patients/public. This is intended to ensure the security & safety of our patients and staff. This also forms part of our on-going service improvement strategy. We have a policy in place in regards to the CCTV system in conjunction with the current regulations as per the data protection code of practice for CCTV (Information Commissioners Office) A request can be made and the request forms are held by the the reception team. There is a minimum charge of £10 for data access requests relating to CCTV as per the current guidelines. Please see link below for further information. Weekly Yoga and Pilates sessions are held here at Peacock Healthcare. Pilates on Wednesdays 5:45 p.m. – 6:45 p.m. with Eve and Yoga on Tuesdays 12:00 p.m. – 1:15 p.m. with Sally. For further details please contact a member of the reception team. Get free, friendly and flexible support to stop smoking by contacting your local smoking service - Nottingham City : 0800 561 2121 Nottingham County: 0800 246 5343 or call the national Smoke free helpline on: 0300 123 1044. We continue to provide Non -Obstetric Ultrasound from Peacock Healthcare in partnership with "Diagnostice Healthcare". 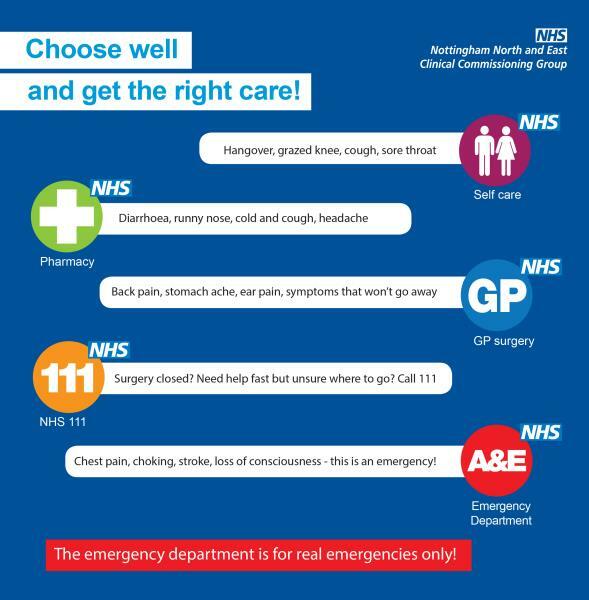 This service is also available to other GP practices in the Nottingham area. NEW NNE NHS Health "APP" for Nottingham. There is also a very useful free "App" available for you to download to your phone/PC/Tablet for local NHS services in the Nottingham area and other useful links, Search: "NHS NNE" on the Apple App Store or via Google Play. Healthwatch Nottinghamshire is an independent organisation that helps people get the best from their local Health & Social Care Services. Please see link below for further information. 90 APPOINTMENTS LOST IN MARCH 2019 DUE TO NON-ATTENDANCE! We would grately appreciate it if our patients would kindly inform us as quickly as possible if they are unable to attend an appointment as this can be quickly allocated to another patient.